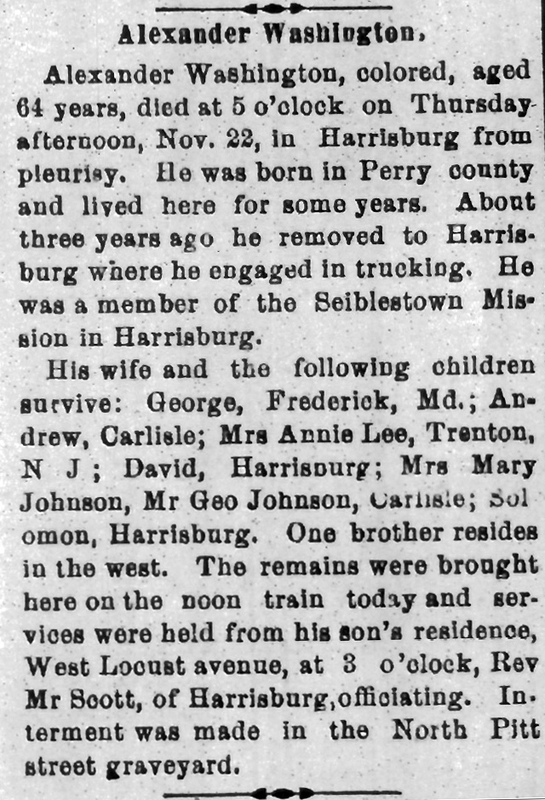 “Alexander Washington,” Carlisle (PA) Herald, November 26, 1900, p. 4: 1. 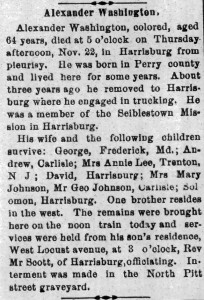 Alexander Washington, colored, aged 64 years, died at 5 o’clock on Thursday afternoon, Nov. 22, in Harrisburg from pleurisy. He was born in Perry county and lived here for some years. About three years ago he removed to Harrisburg where he engaged in trucking. He was a member of the [Seiblestown?] Mission in Harrisburg. His wife and the following children survive: George, Frederick, Md. ; Andrew, Carlisle; Mrs Annie Lee, Trenton, N J ; David, Harrisburg ; Mrs Mary Johnson, Mr Geo Johnson, Carlisle ; Solomon, Harrisburg. One brother resides in the west. The remains were brought here today on the noon train today and services were held from his son’s residence, West Locust avenue, at 3 o’clock, Rev Mr. Scott, of Harrisburg, officiating. Internment was made in the North Pitt street graveyard.